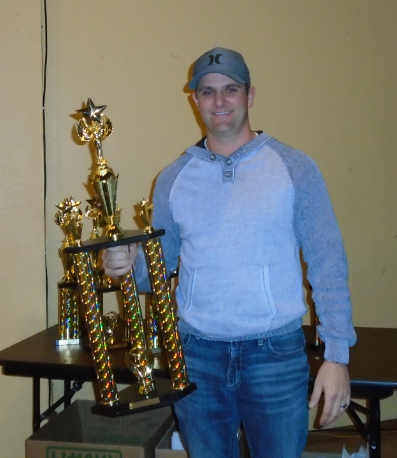 Medford, Oregon...There was a good turnout of racers and family for the annual potluck awards banquet for Southern Oregon Speedway Saturday night. The gathering took place at Los Arcos Restaurant, where the Top 10 drivers in the track's seven core classes received trophies, and "Rookie Of The Year" awards were also handed out. On hand to receive their championship trophies were David Hibbard (Kendall Oil Winged Sprint Cars), John Dees (Late Models), David Marble (IMCA Sport Modifieds), Charlie Eaton (Valley Store All Late Model Lites), David Steele (Bobbio's Pizza Mini Stocks) and Bree Tritchler (JOAT Labs Hornets). 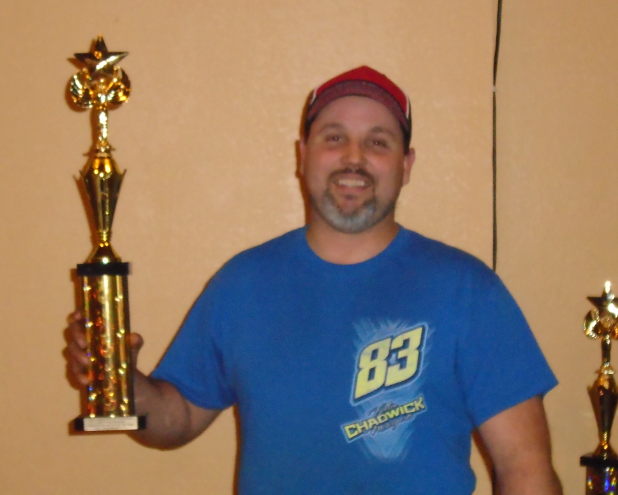 IMCA Modified champion Albert Gill was unable to attend due to prior commitments. 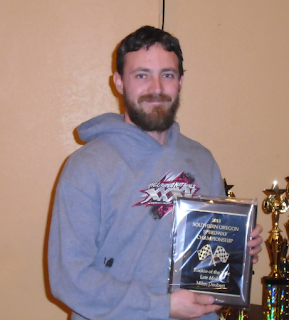 The Southern Oregon Dwarf Cars competed 11 times during the season, and they had their own association banquet where they honored Josh King as champion last year. On the track, Hibbard was a force to be reckoned with with five wins and two seconds in the first seven races. Off the track, he was a driving force in helping grow the Kendall Oil Winged Sprint Car class and also took an active role in promoting the track's Malicious Monster Truck event during the year. David noted that he was very proud to help grow the Sprint Car effort in Medford and has believed for the past several years that the limited rules package was the key to making it happen. John Dees admitted that he was not expecting to win the Late Model championship and just came out there with the goal of doing better than the year before. With one win and five seconds, he was probably the most improved driver of the field. As to what the team is planning to do next year, John said that it was a secret. Miles Deubert's dream come true Late Model effort resulted in top rookie honors. One could also argue that Miles Deubert as the top rookie of the Late Model class was a surprise. In fact, he didn't even know he would be going racing in this division until a couple of months before the season. The deal to buy the car was just too good to pass up. Miles remarked that he's been wanting to go Late Model racing since he was a kid, so last season was a dream come true for him. The IMCA Sport Modified championship was the second title in the career of David Marble, who won the Mini Stock crown back in 2015. David announced that he has a Sprint Car for next season. It was also announced that Top 10 ranked driver and two-time Sport Modified champion Mike Medel would be back full-time this year. Several drivers are building cars, and the Sport Modified count is expected to increase this season. David Steele won nine Mini Stock Main Events and finished second twice in his 11 starts to win the title. He was one of the more respected drivers at the track for his willingness to help the young drivers. Like the Valley Store All Late Model Lites champion, Charlie Eaton, Steele will be back racing in the coming season. The Mini Stock division will get more crowded as Top 5 Hornet competitor Dylan Irving and another Hornet star, Ashtin Hedges, will be running Mini Stocks next season. Bree Tritchler was impressive in her rookie season in the Hornet class. She won one Main Event and finished second five times to not only win the rookie title but championship honors as well. Other "Rookie Of The Year" winners included Blaine Cory (Kendall Oil Winged Sprint Cars), David Satterfield (IMCA Modifieds), Branden Wilson (IMCA Sport Modifieds), Mike McLeod (Bobbio's Pizza Mini Stocks) and Michael Johnson (Southern Oregon Dwarf Cars). 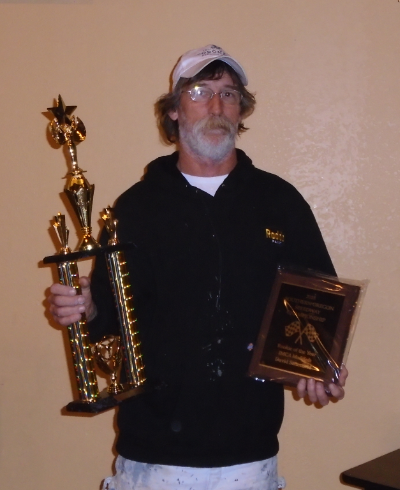 Johnson received his award at the Dwarf Car banquet last year. 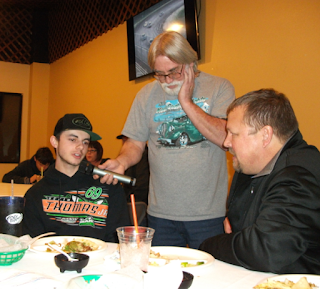 Promoter Mike McCann interviews top Sprint Car rookie Blaine Cory. Promoter Mike McCann not only gave the state of the track address, he also interviewed several racers before the banquet began. McCann thanked all of the people behind the scenes, the great sponsors and the racers for their support in making this the best season the track has had in seven years. McCann indicated that the 2019 schedule would be available within the next couple of weeks. Look for most of the same attractions from last year along with some surprises. People are getting more excited about the speedway, which is now in its 24th season of operation. Things have been improving rapidly during the past few years, and there is every indication that this will be the best season yet under the promotion of McCann. For further information, go to www.southernoregonspeedway.com.